Brown went to college on a basketball scholarship but played football well enough to draw the interest of the Green Bay Packers, who chose him in the 27th round of the 1959 NFL draft. He was cut following the season’s first game and was signed to Philadelphia’s taxi squad. Brown was a backup halfback and kick returner for the ’60 squad that won the NFL title and saw more action in 1961, when he took the opening kickoff of the season 105 yards for a touchdown. In limited play on offense, he rushed for 338 yards and averaged 18.9 yards on his 14 catches. Returning kickoffs, Brown had a 28.0 average on 28 returns with a TD, and one of his eight punt returns was for a touchdown as well. While there were doubts as to whether he could be an every-down back, he got his chance to start during the ’62 season when HB Ted Dean suffered a broken leg. Eagles went 3-10-1 to finish seventh in the NFL Eastern Conference while leading the league in passing yards (3385). Having set a NFL record for all-purpose yards in 1962, Brown exceeded it in ’63 by gaining 2428 yards (841 rushing, 487 pass receiving, 945 returning kickoffs, 152 on punt returns). Fast with surprising power and an excellent receiver out of the backfield, he scored 11 touchdowns and received consensus second-team All-NFL honors as well as another selection to the Pro Bowl. Brown suffered a thigh injury that cost him four games during the 1964 season but returned to rush for a career-high 861 yards in ’65 while averaging a league-leading 5.4 yards-per-carry. He also caught 50 passes for 682 yards and was again chosen to the Pro Bowl as well as receiving second-team All-NFL recognition. The offensive numbers dropped in 1966 but he returned two kickoffs for touchdowns in a game against the Cowboys, becoming the first player in league history to do so. A hamstring injury cost him the early part of the ’67 season and further reduced his effectiveness, and he was traded to the Baltimore Colts for 1968, where he played one final season as a backup halfback and kick returner. Overall, Brown rushed for 3862 yards on 889 carries (4.3 avg.) and 31 TDs (850 attempts for 3703 yards and 29 TDs coming with the Eagles), caught 235 passes for 3399 yards (14.5 avg.) and 26 TDs, (231 for 3346 yards and all of the TDs with Philadelphia), returned 71 punts for a 9.0 average and one TD, and 184 kickoffs for a 26.0 average and five TDs (55 punt returns for 9.3 yards and 169 kickoff returns for 26.5 yards and all of the return TDs with the Eagles). 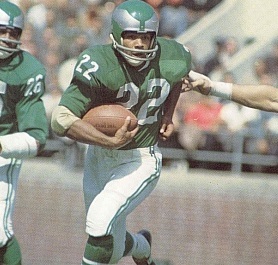 He gained a total of 12,684 all-purpose yards, scored 64 touchdowns (12,049 yards and 62 TDs with the Eagles), and was chosen to three Pro Bowls.